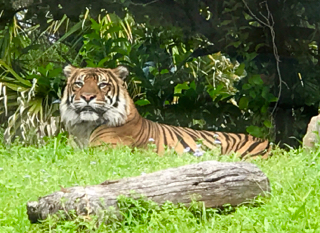 Animal Kingdom is home to two Sumatran tigers, which can be found on the Maharajah Jungle Trek. They aren't always easy to spot, since they sleep for most of the day. However, the 8 year old male (named Milosi) was in a great spot for a photo today. 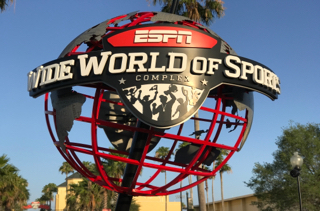 ESPN Wide World of Sports is the Walt Disney World sports complex used by professional and amateur athletes. It is the spring training home of the Atlanta Braves baseball team, and it also hosts many national and international youth competitions. These include cheerleading championships as well as the Pop Warner football Super Bowl. My son played in a Memorial Day youth baseball tournament this past weekend. 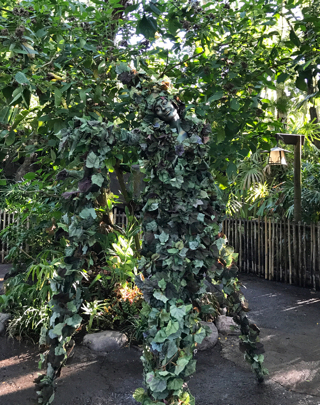 For the past week, most of the attention of Animal Kingdom guests has been on the new Pandora area. 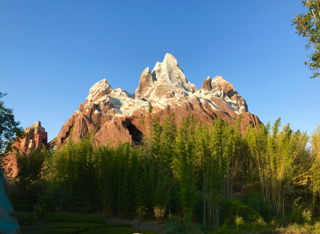 Because of this, the wait times have been less for some of the attractions in other areas of the park, including Expedition Everest. I took this shot after dinner at Restaurantosaurus last night. So, Pandora - The World of Avatar is officially open at Animal Kingdom. I have had the opportunity to visit for advanced previews on a few occasions, but only during the day. However, yesterday I experienced this amazing new area at night, and it was even more incredible. 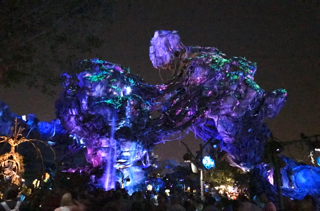 Pandora comes alive with "bioluminescent" lighting and uniquely lit pathways that provide a completely new landscape in the evening. This is a nighttime shot of the floating mountains. 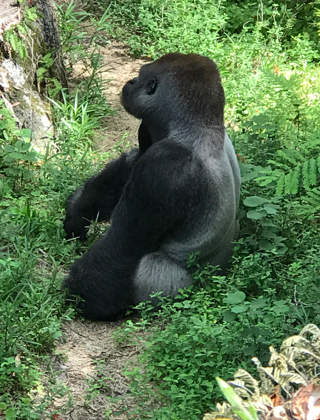 There are four male silverback gorillas in the "bachelor" area of Gorilla Falls at Animal Kingdom. Their habitat is a large area, and it is fun to try to spot these amazing animals. A few days ago, I found this guy sitting at the bottom of a gully, near the exit to Kilimanjaro Safaris. The Crystal Palace is a popular, buffet style, character dining spot in the Magic Kingdom. It features the Winnie the Pooh characters. 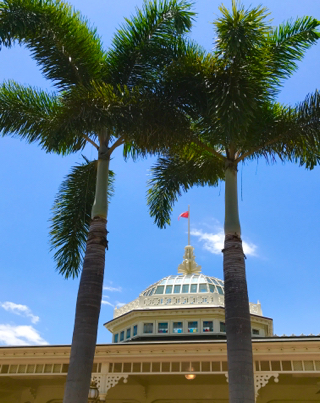 I took this shot yesterday, while waiting for my tour guests to finish up lunch. It was a crystal clear day, which made for some good photos. 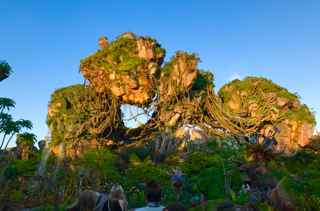 The grand opening of Pandora - The World of Avatar is happening this weekend at Animal Kingdom. Starting on Saturday, there will be huge crowds enjoying this new area of the park. I took this shot of an empty Pandora last week, during a preview. I don't think we will ever see this area this quiet again. 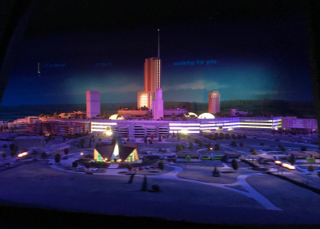 While riding the PeopleMover at Magic Kingdom, guests travel past this large section of a model of "Progress City." This was Walt Disney's vision of a futuristic community that he hoped to build at Walt Disney World. 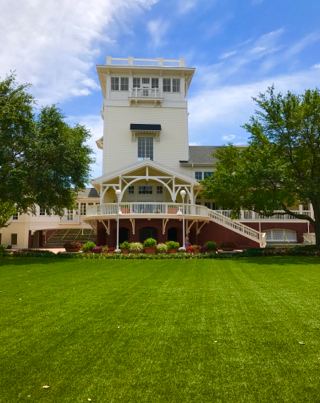 Although Epcot didn't end up being what he originally intended, Disney did eventually build the town of Celebration on their Florida property, and this is where my family currently resides. I took this shot this morning, while spending some time in Tomorrowland. 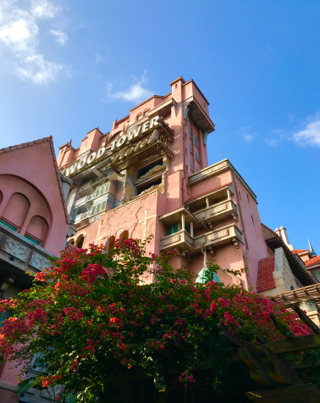 Tower of Terror is one of the best themed attractions in all of Walt Disney World. 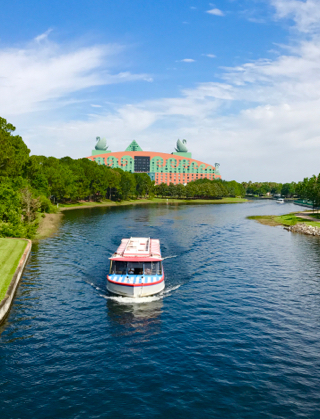 The story, scenery, and pure thrills make this a favorite for many guests. I took this shot while waiting in the Fastpass queue over the weekend. The Boardwalk Resort opened in 1996, and is patterned after the type of hotel found in Atlantic City in the early 1900s. This area of the resort faces Crescent Lake. At first glance, this looks like a perfectly groomed lawn. However, upon further inspection, you will notice that it is actually artificial turf. Frozen Ever After still commands the longest wait times at Epcot, and I don't get the chance to ride it very often. However, I was able to enjoy it yesterday with friends and family. 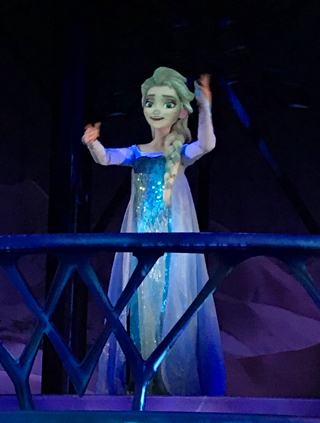 This Elsa animatronic is pretty amazing. While enjoying Magic Kingdom tonight around sunset, we had this view. We were walking thru Tomorrowland when we saw these clouds, and the silhouette of Cinderella Castle. 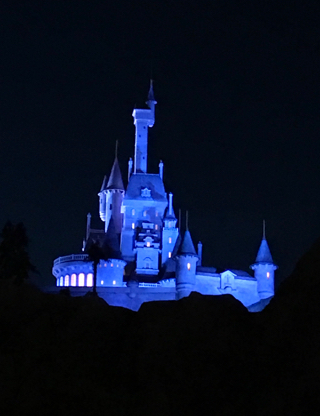 Although I've taken thousands of castle photos, this may be the first from this angle. The Star Wars universe continues to expand and evolve at Hollywood Studios. 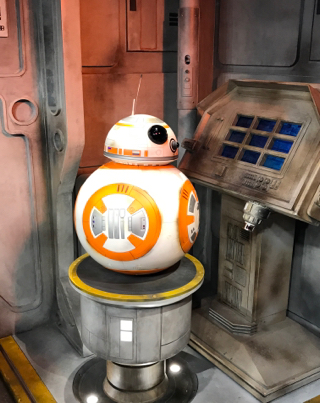 The latest addition is an interaction with the astromech droid, BB-8. He can be found in the Star Wars Launch Bay. When I visited the new Pandora area of Animal Kingdom early in the week, I took hundreds of photos. I will be featuring many of them here, as we approach the official opening next weekend. Here is one of the more amazing figures to be featured in a Disney attraction queue. 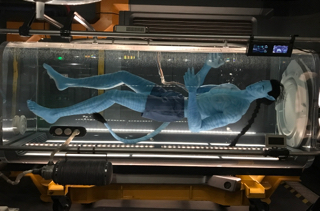 This Avatar can be seen in the standby queue of The Flight of Passage. At first glance, this looks like a picture of some trees. However, if you look closely, you will see a woman's face in the shot. This is Divine, who appears several times a day at Animal Kingdom. She is completely covered in foliage and moves slowly and gracefully. When she is standing still, many guests pass by without realizing what they are missing. There are only a few weeks left in this year's Flower and Garden Festival at Epcot. 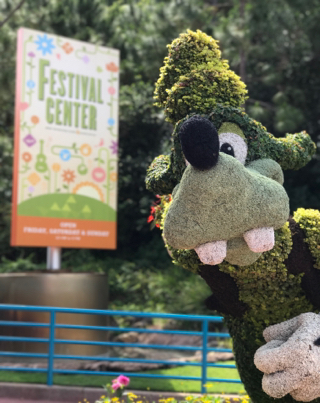 I found myself near the Festival Center this morning, while waiting for my tour guests who were enjoying Ellen's Energy Adventure. I thought it was time for a Goofy shot. 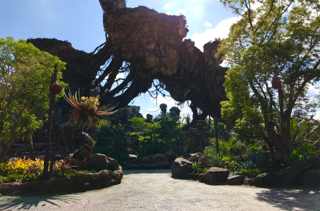 I was able to get my first look inside the amazing new Pandora area at Animal Kingdom today. This incredibly detailed land has so many photo opportunities, and I look forward to shooting here as much as possible. It made sense that my first shot be of the majestic floating mountains. Space Mountain is a very difficult ride to snap a photo on, because it is so dark. 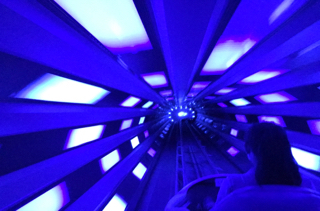 However, the "launch" tunnel has some flashing blue lights, which are just bright enough for a clear shot with the iPhone 7. I used burst mode and picked out the clearest picture. 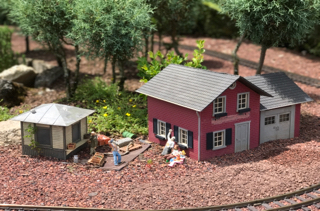 One of the unique features of the Germany pavilion at Epcot is the outdoor model train display that includes a miniature village. The sun was in a good spot yesterday to get some nice close-up pics. I used the portrait feature on my phone for the depth effect. Today, I found myself walking across the bridge above where the boats go from Epcot to Hollywood Studios. There is a walking path that connects the bridge to the walkway adjacent to the river. It was a unique vantage point for a photo of the Swan Resort. 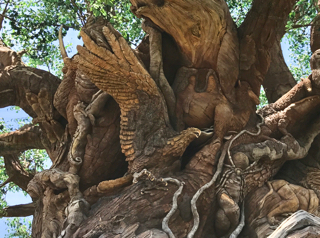 There are several paths around the Tree of Life where you can get nice photos of the animals carved into the trunk and limbs. However, there is one segment of a path that I've never actually seen "open," until yesterday. The newly opened area gave me a great angle to take this shot of the bald eagle. 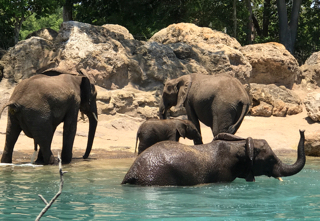 While riding Kilimanjaro Safaris at Animal Kingdom today, I had some great views of the elephants. I always enjoy seeing these magnificent creatures, but today was even more special. In the center of this photo is a baby elephant who was born only about 6 months ago. Her name is Stella, and her birth brings the total number of elephants at this park to 10. The Emporium is the very large gift shop that takes up the entire west side of Main Street, USA in the Magic Kingdom. This store helps to portray the era of Main Street, which is the early 1900s. 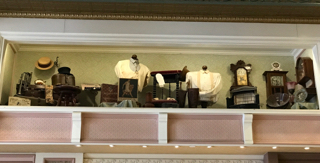 This display can be found high on a shelf in the center of the store, where clothing, furniture, clocks, and photos from that time period can be seen. There is so much detail in the area of the Jungle Cruise queue at the Magic Kingdom. 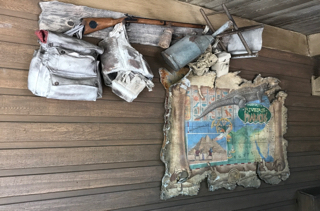 This wall is right behind the FastPass kiosks, and it displays an Egyptian map as well as hunting supplies. However, one of the best features of this spot is something that can't be seen in the photo. There is actually outdoor air conditioning flowing in from the ceiling above that area. 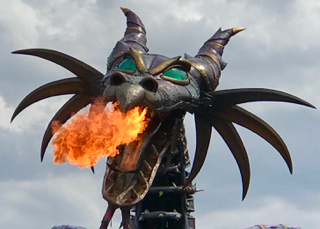 I have posted several photos of the Maleficent float from the Festival of Fantasy parade, over the last few years. However, I had a great angle for another shot a few days ago. This is certainly one of the more impressive figures in the history of Magic Kingdom parades. Although it hasn't been scientifically proven, they say that everything tastes better shaped like Mickey. 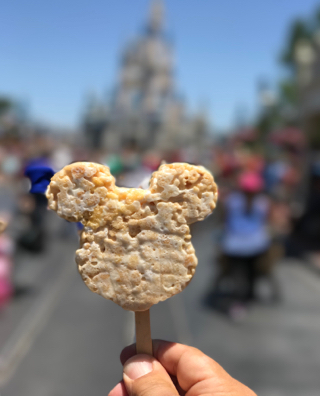 After enjoying this rice krispy treat today, I tend to agree. Before indulging, I decided to take this shot with Cinderella Castle in the background. My favorite time at the Magic Kingdom is early in the morning. It is quiet and peaceful, and I can take photos before the large crowds arrive. 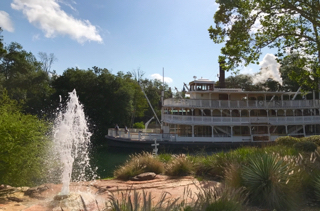 Yesterday morning, I snapped this shot of the Liberty Belle from the exit area of Thunder Mountain. The Festival of Fantasy Parade has been entertaining guests for more than three years now. It has over 100 performers, and many incredible floats. However, it always ends with the "big cheese" himself. 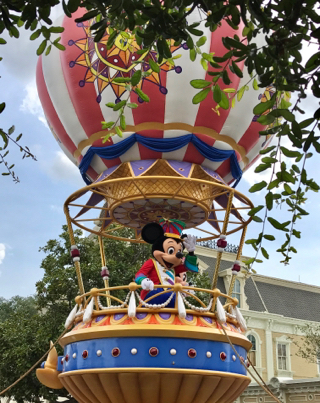 I took this shot of Mickey (and Minnie) near the end of the parade route today. Today, I was riding Dumbo with a tour guest, when I noticed this view. 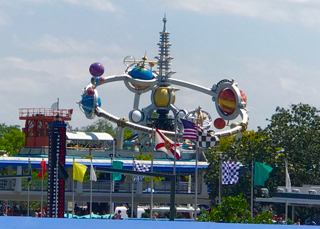 You can see parts of the Tomorrowland Speedway, the PeopleMover, and Astro Orbiter in this shot. It's always fun to take photos of an area from an uncommon angle. 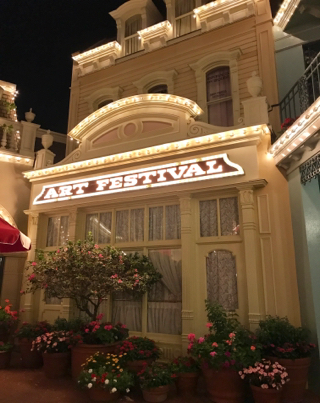 Center Street is one of my favorite "quiet" areas in one of the busiest sections of the Magic Kingdom. Located about halfway up Main Street, USA, this little side street is overlooked by most guests. I took this shot at the end of Center Street a few nights ago. We had the pleasure of eating dinner with good friends at Be Our Guest a few nights ago. After enjoying the "grey stuff" for dessert, we came outside and it was dark out. I took this picture from the bridge leading into the restaurant.